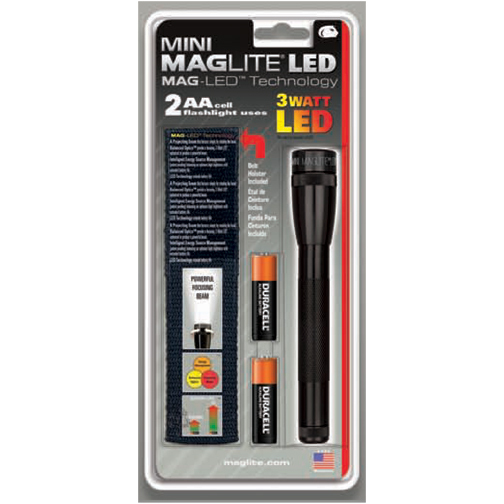 The Mini Mag-Lite LED is the brightest flashlight you have ever seen with only 2 AA batteries. Mini Mag-Lite® LED Flashlight. The previous sku number was SP22. The new sku is 2AALED. THE WORLD FAMOUS MAGLITE® now has the next generation Mag-Led® Technology. It is 6 1/2" in length. Comes with 2 "AA" batteries and packaged in a rich-looking, black presentation box. A perfect corporate gift for any company. A New High performance LED and a more powerful projecting LED beam which focuses simply by rotating the head of the flashlight. 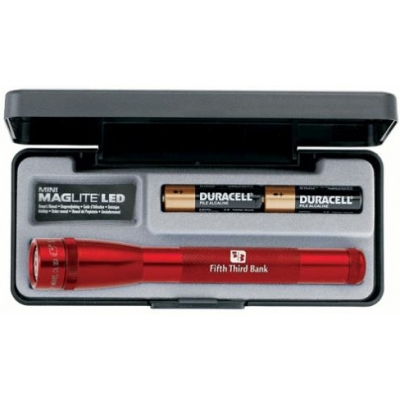 Extended Battery Life for a dependable and durable personal flashlight. Colors: Black, Blue, Red, & Gray, and all the colors shown above.